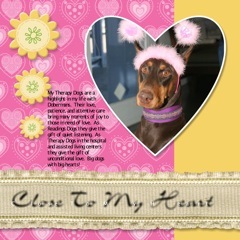 My Therapy Dogs are a highlight in my life with Dobermans. Their love, patience, and attentive care bring many moments of joy to those in need of love. As Reading Dogs they give the gift of quiet listening. As Therapy Dogs in the hospital or assisted living centers they give the gift of unconditional love. Big dogs with big hearts! Here's an article in the Medford Mail Tribune about Reading Dogs.